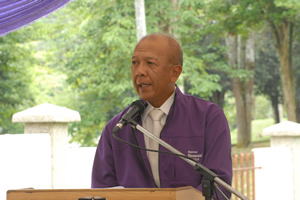 BANGI, 9 Dec. 2010 –Bioserasi laboratory, a Universiti Kebangsaan Malaysia (UKM) toxicity laboratory has been given international recognition as a world class laboratory. The MS ISO/IEC 17025 accreditation certificate by the Malaysian Standards Department (JSM) was handed over by its Director General, Fadilah Baharin to Deputy Vice Chancellor UKM (Research and Innovation ), Prof Dr Rahmah Mohamad in a brief ceremony at the laboratory here today. 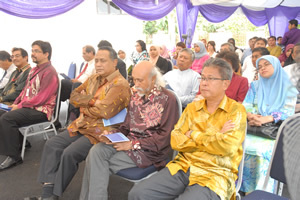 Present at the ceremony was Head of the Bioserasi lab Associate Prof Dr Anuar Osman and a board member of the Federation of Malaysian Manufacturers (FMM) Dato’ Masu’t Abu Samah. 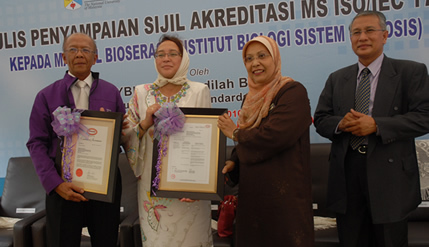 Fadilah said the UKM Bioserasi lab is the second in the country to be awarded the international ISO certification apart from the SIRIM lab. 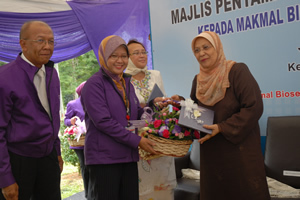 Congratulating UKM for the achievement, she said the tests carried out by the lab is recognised at the international level. This is because the lab has competent and trained staff to conduct tests according to guidelines set to ensure the results have a high level of accuracy and credibility. The role of JSM, she said, is to provide a system that will enable laboratories in Malaysia to follow global specifications and compete with other laboratories internationally. She said the accreditation scheme will benefit the industry and consumers in terms of savings made over costs while both the industry players and consumers are assured of quality, reliability and safety of the products after going through tests by the lab which are also recognised nationally and internationally. “SAMM places great importance on the efficiency of a lab and the credibility of the test findings that is produced, ” she said . The challenge for Bioserasi lab now was to promote its services and maintain the ISO accreditation. She urged UKM and FMM which uses the services of the lab for test of some of their products to work together with JSM to promote the lab. She said tests by Bioserasi lab will automatically be accepted by the various accreditation bodies of other countries as JSM had already signed the “Mutual Recognition Arrangement” (MRA) under “Asia Pacific Laboratory Accreditation Cooperation” eight years ago. 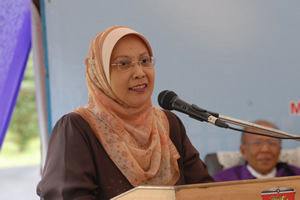 Prof Dr Rahmah in her speech said the accreditation is the culmination of the determination and hard work of the Bioserasi team that ventured into the field of toxicity through research and development in 1997 and pre commercialisation in 2007. She said the achievement by the lab can help the country especially the industry and research institutes that needed to do toxicity test. Prof Dr Rahmah said with the coming into operation of the Medical Devices Act, the service for verification of safety standards would be needed and hoped that clients and authorities will make use of the facilities available in the Bioserasi lab. Dato’ Masu’t in his speech said that FMM members need the services offered by the lab to save their costs for tests overseas thereby reducing outflow of foreign exchange as well. The services available with Bioserasi lab will benefit manufacturers and producers as well as consumers. “It gives us confidence and reduce the risk of inaccurate tests” he said while pledging FMM support in promoting Bioserasi lab not only in the country but to the ASEAN and Asia-Pacific region. Dr Anuar said the lab was established in June 2003 to conduct research on the compatibility of artificial bone with the collaboration of local research institutions. With a grant from the previous Ministry of Science, Technology and Environment, the scope of toxicity test done has been broaden to match international standards and it can now undertake tests in 26 areas. “Standard and test guidelines that are used includes ISO10993, FDA dan OECD, with accepted methods and protocols,” he said. He also said that even though today’s accreditation only consist of eight test scopes, they are already busy preparing to apply for more scopes to be accredited by JSM.